Tshechu mask dance religious festivals are essential part of Bhutanese culture. They are held in different part of the country thorough the year. There are also many other events in Bhutan, ranging from the marathons, bike races, exhibitions, Hindu festivals etc. See our most complete list available on Internet below! Nimalung Tshechu, Nimalung Dratshang, Chummey, Bumthang 9 – 11 Jul 2019 ? Chhukha Tshechu, Chhukha Dzong, Chhukha 4 – 6 Nov 2019 ? Jakar Tshechu, Jakar Dzong, Bumthang 4 – 7 Nov 2019 ? Jambay Lhakhang Drup, Jambay Lhakhang, Bumthang 12 – 15 Nov 2019 ? Mongar Tshechu, Mongar Dzong, Mongar 4 – 6 Dec 2019 ? Please always reconfirm the dates of the festival before making concrete plan, because the date can change due to astrological concerns and other reasons without any notice. Sources: Association of Bhutanese Tour Operators, Tourism Council of Bhutan, Bhutan Travel Portal & our own investigation. 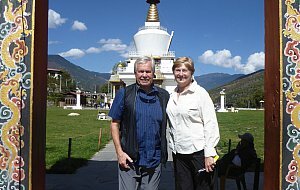 My husband and I had a wonderful tour of Western Bhutan with our excellent guide Nima and driver Suraj.